Although a yearly occurrence, 2017 Leaf Metal Draft Baseball looks to be even more limited this time around. 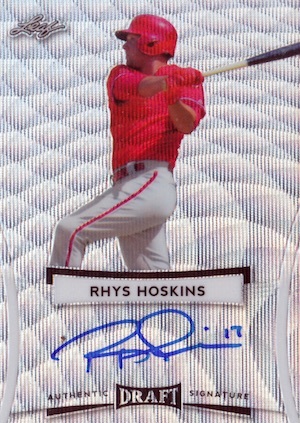 With six on-card autographs per box, collectors should be in prospect heaven. Touting a 2017 Leaf Metal Draft Baseball set that is "Leaf's strongest ever rookie baseball checklist," signed cards are the only thing coming out of these boxes. Featuring top draftees, like 2017's number-one overall pick, Royce Lewis, alongside key MLB rookies, such as Cody Bellinger and Rhys Hoskins, the lineup appears potent. In addition to the main Autograph design set around a burst of light are multiple tiers of Prismatic parallels. There are also signed Future Stars and State Pride inserts. While more details will be added when known, 2017 Leaf Metal Draft Baseball is likely to be fundamentally similar to the 2016 set. 2017 ADAM HASELEY Leaf Metal Draft AUTOGRAPH Blue 8 25 #BA-AH1 PSA 9 mint! 2017 ADAM HASELEY Leaf Metal Draft AUTOGRAPH #BA-AH1 PSA 10 gem mint! Redemptions (R) are noted below. 81 cards. Short Prints (SP) and Super Short Prints (SSP) noted. PARALLEL CARDS: Wave**, Blue #/25 (Bellinger - #/20*), Purple #/20 or #/15, Pink #/15 or #/10, Black #/10 or #/7, Green #/7 or #/5, Red #/5 or #/3, Gold 1/1, Gold Super 1/1, Printing Plates 1/1. MATT MANNING PARALLELS: Wave, Blue #/50, Purple #/25, Pink #/20, Black #/15, Green #/10, Red #/5, Gold 1/1, Gold Super 1/1. PARALLEL CARDS: Wave, Blue #/25, Purple #/15, Pink #/10, Black #/7, Green #/5, Red #/3, Gold 1/1, Gold Super 1/1. 16 cards. Short prints noted (SP). PARALLEL CARDS: Wave, Blue #/25 or #/20, Purple #/15, Pink #/10, Black #/7, Green #/5, Red #/3, Gold 1/1, Gold Super 1/1, Printing Plates (No Garrett, Hall, Manning, Senzel, Romero*). MATT MANNING PARALLELS: Wave, Blue #/35, Purple #/25, Pink #/15, Black #/10, Green #/5, Red #/3, Gold 1/1, Gold Super 1/1. PARALLEL CARDS: Wave, Blue #25, Purple #15, Pink #/10, Black #/7, Green #/5, Red #/3, Gold 1/1, Gold Super 1/1, Printing Plates 1/1. PARALLEL CARDS: Blue #/25, Purple #/20, Pink #/15, Black #/10, Green #/7, Red #/5, Gold 1/1, Gold Super 1/1.